Kalimantan is the second largest island in Indonesia so it is reasonable that Kalimantan has dozens of beaches in every corner. With the position of Kalimantan overlooking the Java Sea, Kalimantan’s beaches have slight different characteristics with Bali’s beaches. Nevertheless Kalimantan’s beaches have beauty that is not less than the beaches in Bali or Java. You can find virgin beaches to well-managed beaches, ranging from the city center to the hinterland bordering Malaysia. Let’s find out the best beaches in Kalimantan Indonesia. Lamaru Beach is a favorite tourist attraction in East Kalimantan. At Lamaru Beach, you will feel the cool and serene atmosphere as the beach is surrounded by many pine trees. You can also enjoy the clear sea water, friendly waves, and the sea breeze. Strolling along Lamaru Beach will make you relax. You can also ride a horse to get around enjoying the beach atmosphere and the green of pine trees. In addition around the beach there are tube rentals, water bikes, banana boats, food stalls and rest rooms. 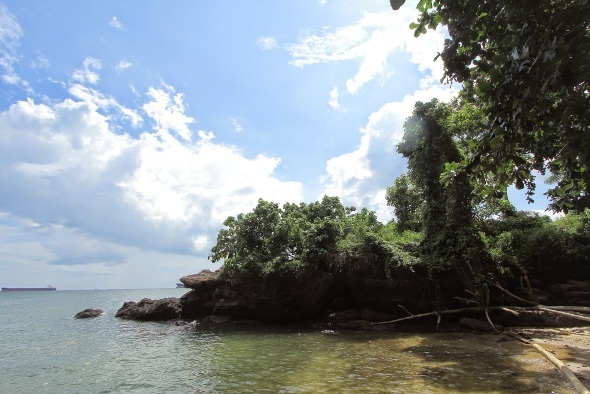 Lamaru Beach is located in Teritip Village, East Balikpapan, East Kalimantan Province. It’s about 24 km from downtown Balikpapan. The admission is Rp 15,000 / person. The parking fee for motorbike is Rp 5,000 while car is Rp 15,000. Opening hours is 6 am-6 pm. Also take time to explore Balikpapan. There are lots of things to do in Balikpapan. 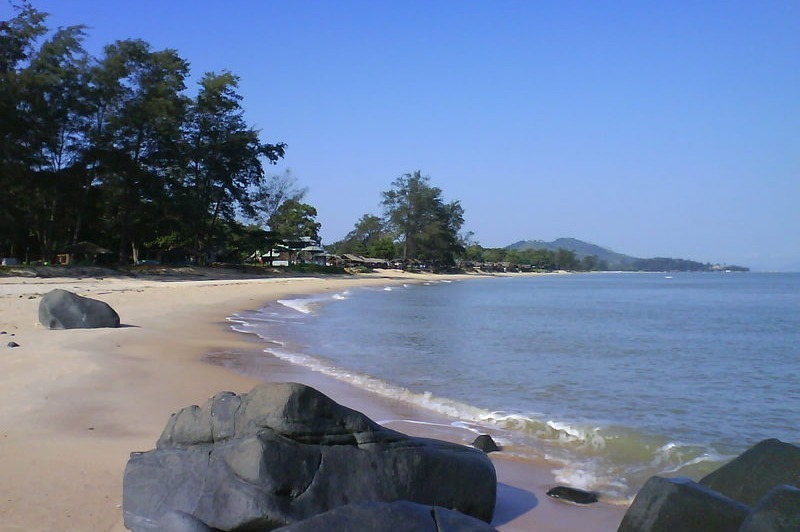 Unlike other beaches, Banua Patra Beach is filled with large and small rocks. Because of its uniqueness, the beach has many instagramable spots. No wonder the photography enthusiasts often make the Banua Patra Beach as the location of photo hunting. Banua Patra Beach is located at Jendral Sudirman Street, Balikpapan, East Kalimantan Province. It’s free entry. Manggar Beach Segara Sari has clear sea, white sand, and relatively calm waves. The beach is a great place for a family vacation. Every weekend Manggar Segara Sari Beach is crowded by visitors from various regions of Kalimantan. Manggar Beach Segara Sari has complete facilities. There are jet ski rentals, banana boats, rubber boats, gazebos, food stalls, and large parking areas. In addition there are also praying rooms, rest rooms, children play ground and open stage. On national holidays, Manggar Segara Sari Beach often becomes a place of cultural or creative performances. Manggar Segara Sari Beach is located in Manggar Village, East Balikpapan, East Kalimantan Province. It’s about 20 km from downtown Balikpapan. The admission for adults is Rp 3,000 / person and children is Rp 2,000 / person. The parking fee for motorbike is Rp 5,000 while car is Rp 10,000. Opening hours is 6 am – 6 pm. 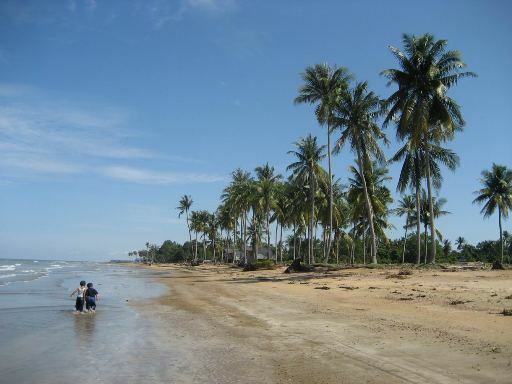 Amal Tarakan Beach is a flagship tourist attraction of North Kalimantan. The charm of Amal Tarakan Beach is its brown sand and friendly waves. 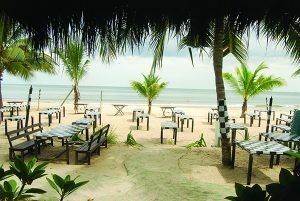 The scenery of coconut trees and the sea breeze also make visitors love to linger here. On the weekend Amal Tarakan Beach becomes a place of recreation for the residents of Tarakan, ranging from picnics, playing ball, playing water, to hanging out with friends. Around the beach there are also food stalls serving seafood. Amal Tarakan Beach is located in Amal Village, East Tarakan, North Kalimantan Province. It’s about 11 km from downtown Tarakan. The admission is Rp 5,000 / person. Opening hours is 6 am – 6 pm. Visiting Amal Tarakan Beach is just one of many things to do in Tarakan. 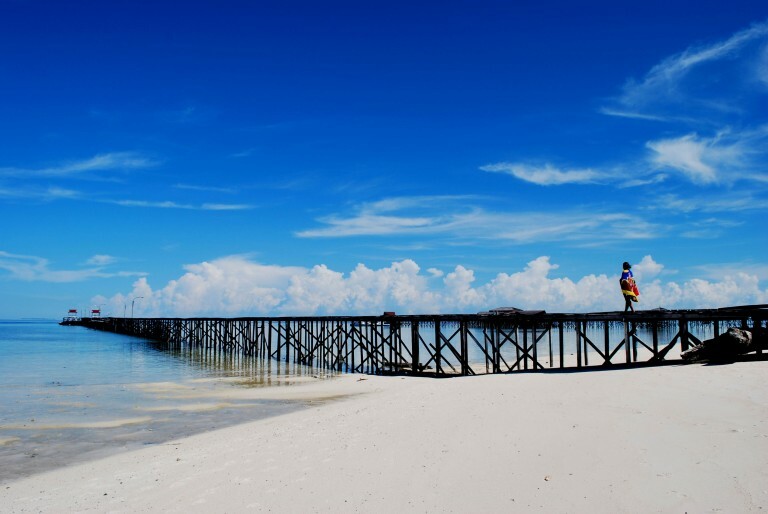 Angsana Beach is a rising tourist attraction in South Kalimantan. Angsana Beach has a stretch of white sand and incredible underwater beauty. 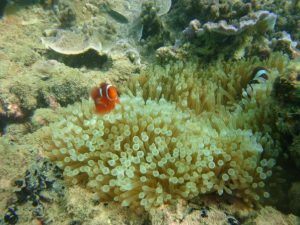 You will have no trouble enjoying the beauty of coral reefs and colorful fish because it is located not far from the beach. In addition you can also perform a variety of exciting activities such as fishing, jet skiing, playing banana boat and enjoying the sunset. Around the beach there are dive shops that offer diving or snorkeling tours at affordable prices. Facilities at Angsana Beach are also complete such as rinse rooms, rest rooms, food stalls and praying rooms. Angsana Beach is located in Angsana Village, Tanah Bumbu Regency, South Kalimantan Province. It’s about 5 hours drive from Banjarmasin. The admission is Rp 6,000 / person. Opening hours is 6 am – 6 pm. Don’t miss the chance to go for a stroll in Banjarmasin. You will find lots of things to do in Banjarmasin. Pagatan Beach is a cheap tourist attraction. There is no admission, you are free to enjoy the atmosphere of the beach. Pagatan Beach is located on the edge of the highway so it is easy to reach by everyone. Pagatan Beach is also famous for its Sea Festival, an expression of the gratitude of fishermen over the abundant sea catch. The festival, which is usually held in April, is in the form of releasing offerings that had previously been given a spell to the sea. The festival is also enlivened by the presence of music attractions, traditional dances and colorful fishing boats. Pagatan Beach is located in Kusam Hilir, Tanah Bumbu Regency, South Kalimantan Province. It’s on the highway that connects South Kalimantan Province and East Kalimantan Province; about 5 hours drive from Banjarmasin. 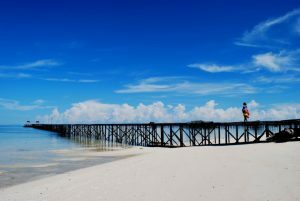 Kijing Beach is a favorite tourist attraction in West Kalimantan. 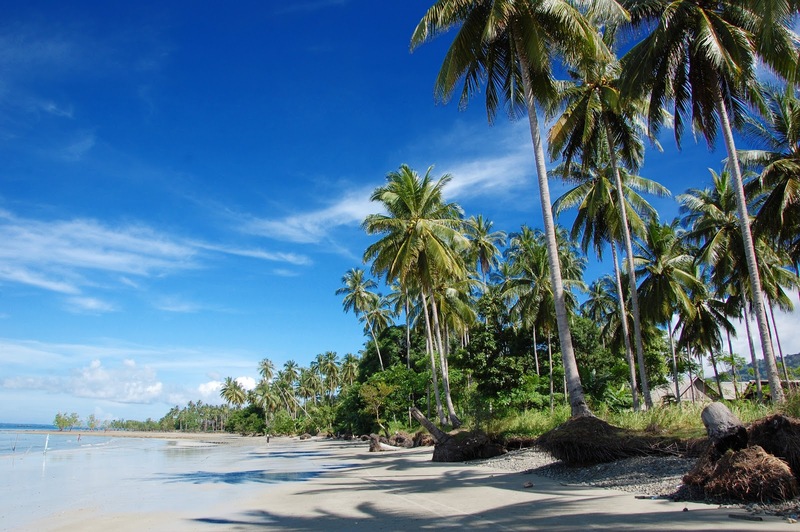 Kijing Beach has a stretch of white sand and is filled with rows of coconut trees. The shady atmosphere and the sea breeze make anyone happy to linger here. The afternoon at Kijing Beach is breathtaking. The beauty of the sunset on the high seas is amazing, should not be missed. Facilities at Kijing Beach are good, there are praying rooms, food stalls and stage for shows. 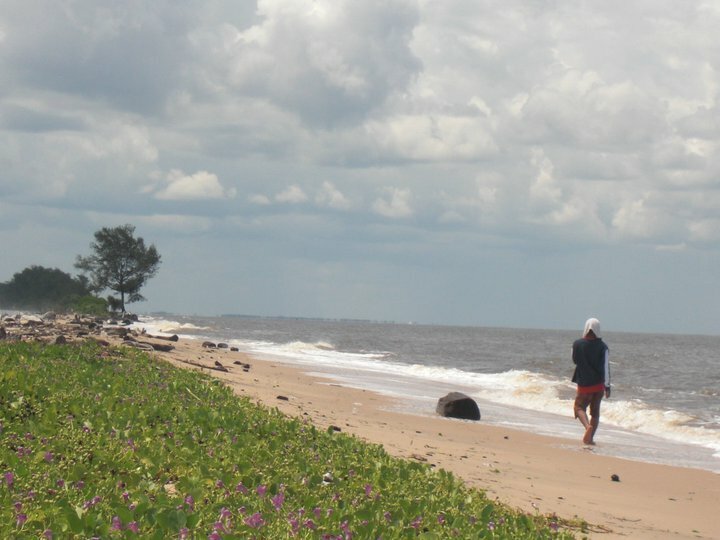 Kijing Beach is located in Mempawah, Pontianak Regency, West Kalimantan Province. It’s about 3 hours drive from downtown Pontianak. The admission is Rp 5,000 / person. Anyway you should stop by Pontianak. There are many things to do in Pontianak. It is said that Turtle Beach is where the turtles lay their eggs. But sadly now the turtles are rarely seen here. Turtle Beach has an unspoiled beauty. The beach is dominated by yellow sand and hundreds of large granite stones scattered around the beach. The best time to enjoy Turtle Beach is at night. Since there is no electricity, lighting only relies on moonlight, starlight and dim light from oil lamps. Accompanied by the sound of the waves and the sea breeze, you can feel the atmosphere of peace and serene at Turtle Beach. Turtle Beach is located in Karimunting Village, Bengkayang Regency, West Kalimantan Province. It’s about 3 hours drive from downtown Pontianak. The admission is Rp 10,000 / person. 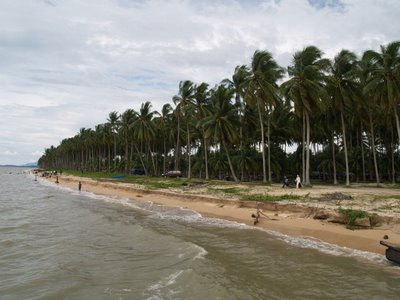 Ujung Pandaran Beach is a favorite tourist attraction in Central Kalimantan. Every weekend the beach is crowded with tourists. They enjoy the beauty of Ujung Pandaran Beach which has white sand and rows of coconut trees along the coastline. At dusk, Ujung Pandaran Beach offers a very beautiful atmosphere. You can enjoy the sunset while relaxing in the gazebo. 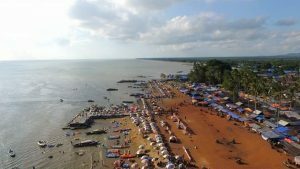 Ujung Pandaran Beach is also used by fishermen as the location of Sea Festival. The festival, held 10 days after Eid ul-Fitr, aims to ask for safety and fortune during fishing. Ujung Pandaran Beach is located in Ujung Pandaran Village, Sampit Bay, East Kotawaringin Regency, Central Kalimantan Province. It’s about 2 hours drive from Sampit or 6 hours drive from Palangkaraya. The admission is Rp 2,000 / person. Palangkaraya is also an interesting city. Stop by and you will see there are lots of things to do in Palangkaraya. Nipah Nipah Beach has a natural beauty and is still rarely visited by tourists. This brown sand beach is located in Balikpapan Bay. At night, from Nipah Nipah Beach you can see the sparkling lights of Balikpapan city. 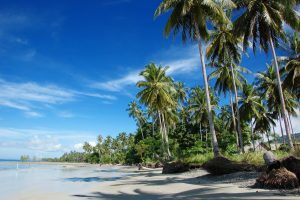 The government believes Nipah Nipah Beach has tourism potential that is not less to other beaches. Therefore, the government is working on the development of supporting facilities to maximize the potential of Nipah-Nipah Beach. Thus it’s expected to increase the number of tourist visits. Nipah Nipah Beach is located in Nipah-Nipah Village, Penajam Paser Utara Regency, East Kalimantan Province. It’s free entry. Takisung Beach has uniqueness that is second to none. Its sand is reddish-brown, really amazing. Its blue sea is relatively calm, the waves come up only occasionally. It’s likely because Takisung Beach is overlooking the Java Sea which is also relatively quiet. Takisung Beach has a beautiful panorama. You can see the vast expanse of sand decorated by rows of coconut trees. 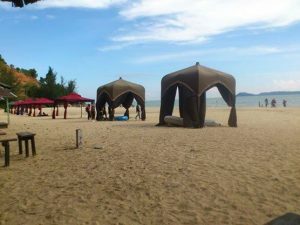 Various facilities are also available at Takisung Beach such as rentals for ATVs, banana boats, boats, umbrellas, tents and rest rooms. 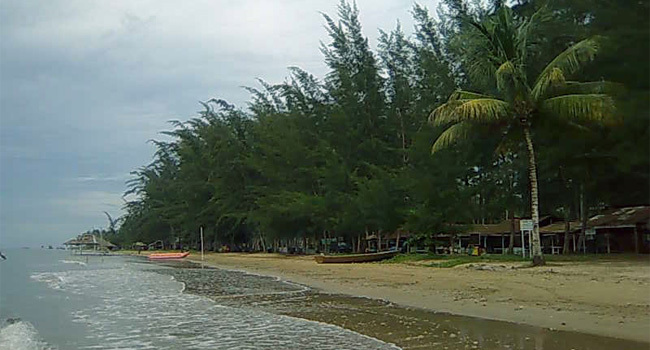 Takisung Beach is located in Takisung Village, Tanah Laut Regency, South Kalimantan Province. It’s about 87 km from Banjarmasin. The admission is Rp 10,000 / person. The beauty of Gedambaan Beach is guaranteed not to disappoint you. Gedambaan Beach has the charm of a typical tropical beach like white sand, towering coconut trees, clear sea and gentle sea breeze. If the sea is tide then as far as the eye can see there is only the green clear sea. The facilities at Gedambaan Beach are complete. There are inns, cafes, fishing ponds, play ground, food stalls, praying rooms and parking lots. Every holiday the beach is crowded by visitors from all over Kalimantan. Gedambaan Beach is located in Gedambaan Village, North Sea Island, Kotabaru Regency, South Kalimantan Province. First from Banjarmasin you drive to Batu Licin. Then from Batu Licin you cross by ferry to Kotabaru. From Kotabaru you continue the journey to the north; you will arrive at Gedambaan Beach in 20 minutes. The admission on weekdays is Rp 2,500 while on weekend is Rp 5,000. Pasir Panjang Beach has a stretch of white sand that stretches along 3 km. With its blue sea and calm waves, the beach is often used as a family vacation spot. Small islands around Pasir Panjang Beach add to the beauty of the scenery. If the weather is sunny, in the distance you can see the land of Malaysia. At dusk the flying fish are often seen dancing above sea level. Pasir Panjang Beach is also one of the best places in Kalimantan to enjoy the beauty of the sunset. Pasir Panjang Beach is located in Singkawang, West Kalimantan Province. It’s about 4 hours drive from Pontianak. The admission is Rp 5,000 / person. Besides visiting Pasir Panjang Beach, you still have other things to do in Singkawang. Pantai Batu Payung is a well-run tourist attraction. 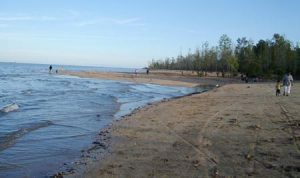 The beach has soft brown sand, shady trees and a clean environment. Rows of small islands in the distance add to the charm of the landscape. Batu Payung Beach is equipped with various rides, such as bicycle wind, flying fox, bom bom car, windmill, spin play, and swimming pool. There are also boat rentals, inns and restaurants. Batu Payung Beach is easy to access because the road from the highway to the entrance gate has been paved. Batu Payung Beach is located in Karimunting Village, Bengkayang Regency, West Kalimantan Province. It’s about 3.5 hours drive from Pontianak. The admission is Rp 20,000 / person, excluding rides tickets. 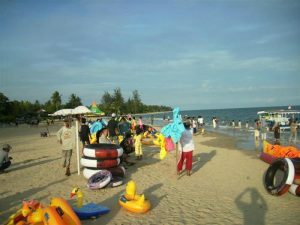 Located in the middle of the city, Kemala Beach is always crowded on weekdays and holidays. The soft sand, the calm sea, the refreshing sea breeze and the clean environment are the attraction of Kemala Beach. From afternoon till night people, especially young people, love hanging out here. On the beach there are food stalls that sell various menus with affordable prices, and with outdoor tables overlooking the sea. In addition there are also rentals for jet ski, banana boat and flying fox. The atmosphere is fun and comfortable, making Kemala Beach into one of the popular hangout places. 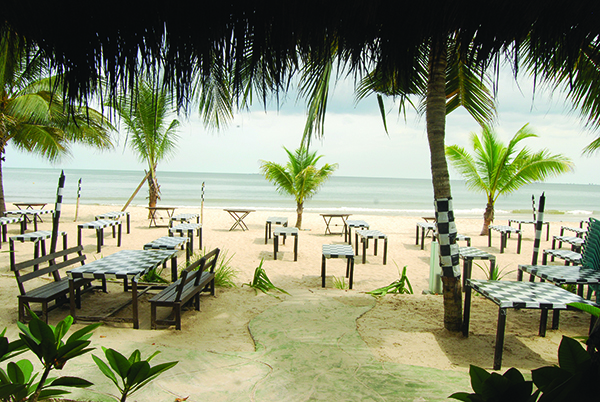 Kemala Beach is located at Jendral Sudirman Street, Balikpapan, East Kalimantan Province. The admission is Rp 5,000 / person. Ok guys, now you know the best beaches in Kalimantan Indonesia. No doubt Indonesia has the best Places To Visit in Indonesia with its beautiful nature and culture. Let’s visit Kalimantan Indonesia..!